The Lower Hall is the largest of the ground floor rooms. It has a timbered floor, offers stacking chairs & foldable tables as well as a number of armed chairs. There is an electric piano and double electrical points around the room. The Lower Hall is adjacent to the Church and Primary Room (both with interconnecting doors). 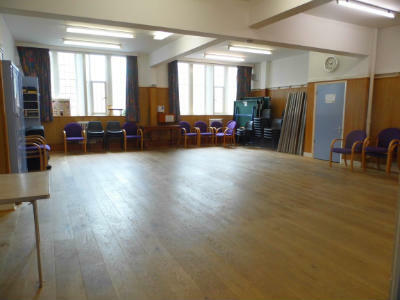 The Lower Hall and Primary Room can be hired together – please enquire for price. A PA system with loop can be provided – at an additional cost.